Safety - Our own in house instructors can make sure your drivers are not only competent but safe operators of your Truck Mounted Forkifts (e.g. Moffett Mounty, Palfinger). Practical - Our Instructors are specialists in truck mounted forklifts including Moffett Mounty driver training, Moffett-Kooi, Kooi aap and Palfinger. Product knowledge enables our instructors to show each driver all the procedures unique to this type of equipment including mounting the TMF onto the Lorry. Qualified - Training TMF drivers to the National Plant Operators Registration Scheme (NPORS) standard means completing our training gives your drivers a TMF licence respected by the Health and Safety commission and the construction industry. Tailored - TMF Driver Training Courses can be designed to suit experience. Whether you have been driving Truck Mounted Forklift for years or are a complete beginner we can provide a course that gets you the TMF licence you need. 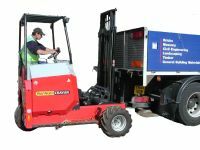 Flexible - Having our own Moffett truck mounted forklifts and Lorries allows us to provide all the equipment necessary for TMF driver training. Alternatively we can carry out training on site using your own equipment.